Hecho En Series There are 50 products. Create your own custom shirt in the style of the Hecho en Mexico logo. Just tell us what you want your shirt to say in the box below. Available in multiple colors and almost every size imaginable. Ask us about combining this logo with another on the same shirt. 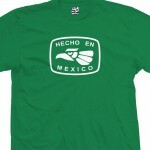 Show some pride in your homeland with the Hecho En Mexico Shirt. Available in multiple colors and almost every size imaginable. If you're looking for a Hecho En Somewhere Else Shirt, check out our Custom Hecho En Shirt. Show some pride in your homeland with the Hecho En America Shirt. Available in multiple colors and almost every size imaginable. If you're looking for a Hecho En Somewhere Else Shirt, check out our Custom Hecho En Shirt. Show some pride in your hometown with the Hecho En Brooklyn Shirt. Available in multiple colors and almost every size imaginable. If you're looking for a Hecho En Somewhere Else Shirt, check out our Custom Hecho En Shirt. 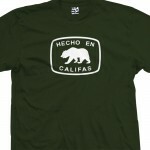 Represent California in style with the Hecho En Califas Bear Shirt. Available in multiple colors and almost every size imaginable. If you're looking for a Hecho En Somewhere Else Shirt, check out our Custom Hecho En Shirt. Represent Southern California in style with the Hecho En Califas Bear Shirt. Available in multiple colors and almost every size imaginable. If you're looking for a Hecho En Somewhere Else Shirt, check out our Custom Hecho En Shirt. Represent Cali in style with the Hecho En California Bear Shirt. Available in multiple colors and almost every size imaginable. If you're looking for a Hecho En Somewhere Else Shirt, check out our Custom Hecho En Shirt. 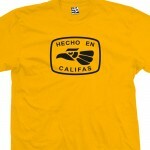 Show some pride in your home state with the Hecho En Califas Shirt. Available in multiple colors and almost every size imaginable. If you're looking for a Hecho En Somewhere Else Shirt, check out our Custom Hecho En Shirt. Show some pride in your hometown with the Hecho En Los Angeles Shirt. Available in multiple colors and almost every size imaginable. If you're looking for a Hecho En Somewhere Else Shirt, check out our Custom Hecho En Shirt. Show some pride in your hometown with the Hecho En Sur Califas Shirt. Available in multiple colors and almost every size imaginable. If you're looking for a Hecho En Somewhere Else Shirt, check out our Custom Hecho En Shirt. 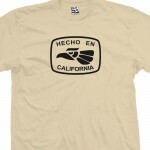 Show some pride in your home state with the Hecho En California Shirt. Available in multiple colors and almost every size imaginable. If you're looking for a Hecho En Somewhere Else Shirt, check out our Custom Hecho En Shirt. Show some pride in your hometown with the Hecho En Cuba Shirt. Available in multiple colors and almost every size imaginable. If you're looking for a Hecho En Somewhere Else Shirt, check out our Custom Hecho En Shirt. 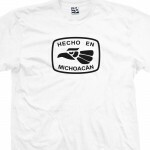 Show some pride in Michoacan with the Hecho En Michoacán Mexico Shirt. Available in multiple colors and almost every size imaginable. If you're looking for a Hecho En Somewhere Else Shirt, check out our Custom Hecho En Shirt. Show some pride in your hometown with the Hecho En Baja Shirt. Available in multiple colors and almost every size imaginable. If you're looking for a Hecho En Somewhere Else Shirt, check out our Custom Hecho En Shirt. Show some pride in your hometown with the Hecho En D.F. Mexico Shirt. Available in multiple colors and almost every size imaginable. If you're looking for a Hecho En Somewhere Else Shirt, check out our Custom Hecho En Shirt. Show some pride in your hometown with the Hecho En Jalisco Mexico Shirt. Available in multiple colors and almost every size imaginable. If you're looking for a Hecho En Somewhere Else Shirt, check out our Custom Hecho En Shirt. Show some pride in your hometown with the Hecho En Texas Shirt. Available in multiple colors and almost every size imaginable. If you're looking for a Hecho En Somewhere Else Shirt, check out our Custom Hecho En Shirt. Show some pride in your hometown with the Hecho En Arizona Shirt. Available in multiple colors and almost every size imaginable. If you're looking for a Hecho En Somewhere Else Shirt, check out our Custom Hecho En Shirt. Show some pride in your hometown with the Hecho En Chicago Shirt. Available in multiple colors and almost every size imaginable. If you're looking for a Hecho En Somewhere Else Shirt, check out our Custom Hecho En Shirt. Show some pride in your hometown with the Hecho En Michigan Shirt. Available in multiple colors and almost every size imaginable. If you're looking for a Hecho En Somewhere Else Shirt, check out our Custom Hecho En Shirt. Show some pride in your hometown with the Hecho En The Bronx New York Shirt. Available in multiple colors and almost every size imaginable. If you're looking for a Hecho En Somewhere Else Shirt, check out our Custom Hecho En Shirt. Show some pride in your hometown with the Hecho En Manhattan New York Shirt. Available in multiple colors and almost every size imaginable. If you're looking for a Hecho En Somewhere Else Shirt, check out our Custom Hecho En Shirt. Show some pride in your home away from home with the Hecho En East L.A. Shirt. Available in multiple colors and almost every size imaginable. If you're looking for a Hecho En Somewhere Else Shirt, check out our Custom Hecho En Shirt. Show some pride in your hometown with the Hecho En San Diego Shirt. Available in multiple colors and almost every size imaginable. If you're looking for a Hecho En Somewhere Else Shirt, check out our Custom Hecho En Shirt. Show some pride in your home turf with the Hecho En El Barrio Shirt. Available in multiple colors and almost every size imaginable. If you're looking for a Hecho En Somewhere Else Shirt, check out our Custom Hecho En Shirt. 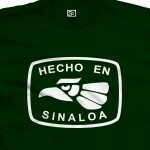 Show some pride in your hometown with the Hecho En Sinaloa Shirt. Available in multiple colors and almost every size imaginable. If you're looking for a Hecho En Somewhere Else Shirt, check out our Custom Hecho En Shirt. 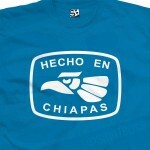 Show some pride in your hometown with the Hecho En Chiapas Mexico Shirt. Available in multiple colors and almost every size imaginable. If you're looking for a Hecho En Somewhere Else Shirt, check out our Custom Hecho En Shirt. Show some pride in your hometown with the Hecho En Nuevo Leon Mexico Shirt. Available in multiple colors and almost every size imaginable. If you're looking for a Hecho En Somewhere Else Shirt, check out our Custom Hecho En Shirt. Show some pride in your hometown with the Hecho En Nayarit Mexico Shirt. Available in multiple colors and almost every size imaginable. If you're looking for a Hecho En Somewhere Else Shirt, check out our Custom Hecho En Shirt. Show some pride in your hometown with the Hecho En Sonora Shirt. Available in multiple colors and almost every size imaginable. If you're looking for a Hecho En Somewhere Else Shirt, check out our Custom Hecho En Shirt. Show some pride in your homeland with the Hecho En Canada Shirt. Available in multiple colors and almost every size imaginable. If you're looking for a Hecho En Somewhere Else Shirt, check out our Custom Hecho En Shirt. Show some pride in your home away from home with the Hecho En Los Campos Shirt. Available in multiple colors and almost every size imaginable. If you're looking for a Hecho En Somewhere Else Shirt, check out our Custom Hecho En Shirt. Show some pride in your home away from home with the Hecho En Las Calles Shirt. Available in multiple colors and almost every size imaginable. If you're looking for a Hecho En Somewhere Else Shirt, check out our Custom Hecho En Shirt. Show some pride in your hometown with the Hecho En Colorado Shirt. Available in multiple colors and almost every size imaginable. If you're looking for a Hecho En Somewhere Else Shirt, check out our Custom Hecho En Shirt. Show some pride in your hometown with the Hecho En El Norte Shirt. Available in multiple colors and almost every size imaginable. If you're looking for a Hecho En Somewhere Else Shirt, check out our Custom Hecho En Shirt. Show some pride in your hometown with the Hecho En Orange County Shirt. Available in multiple colors and almost every size imaginable. If you're looking for a Hecho En Somewhere Else Shirt, check out our Custom Hecho En Shirt.